August 12, 1935: Judy and her sisters, as “The Garland Sisters” filmed their one song, “La Cucaracha” for the all-star Technicolor short La Fiesta de Santa Barbara. The short was filmed on location in Santa Barbara, California and was the last time the sisters appeared on film together (they had previously made several Vitaphone shorts in 1929/1930). This was also their last job as a trio. The two older sisters were getting older and ready to move on, and by this point, Judy and her incredible talent were the focus of the act. It was clear to anyone that she had a future as a soloist. 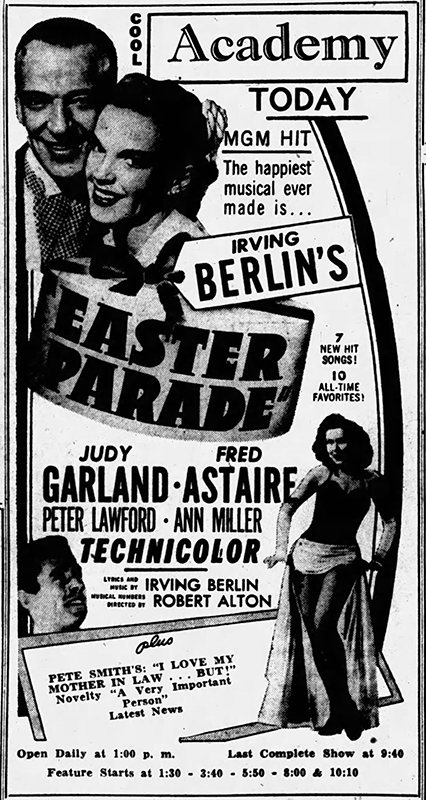 The short is notable for several reasons: It’s the first time Judy appeared on film in color; It’s the only footage of the sisters, performing or otherwise; it’s technically Judy’s first MGM film as it was produced by Pete Smith and directed by Lewis Lewyn but distributed by MGM under the MGM logo. Judy would successfully audition for the studio a month later. The short was nominated for the Oscar for “Best Color Short” but lost to Warner Bros.’ Give Me Liberty. More about the shorts made by Judy and her sisters can be found at The Judy Room’s “Shorts – The Gumm Sisters” page. August 12, 1937: This fantastic four-page spread was published in the “Film Daily” trade magazine promoting Broadway Melody of 1938 which was Judy’s first feature film for MGM and second feature film overall. Broadway Melody of 1938 is the film in which Judy premiered “(Dear Mr. Gable) You Made Me Love You” and coupled with her powerhouse solo of “Everybody Sing” she almost stole the whole film from the rest of the stars. Even so, she was singled out in reviews of the film. 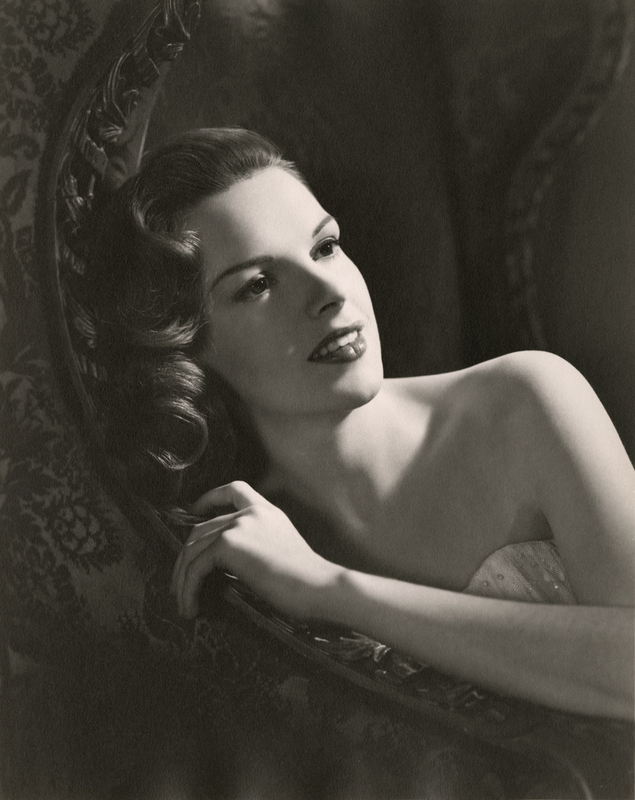 Judy Garland was solidly on her way to superstardom! 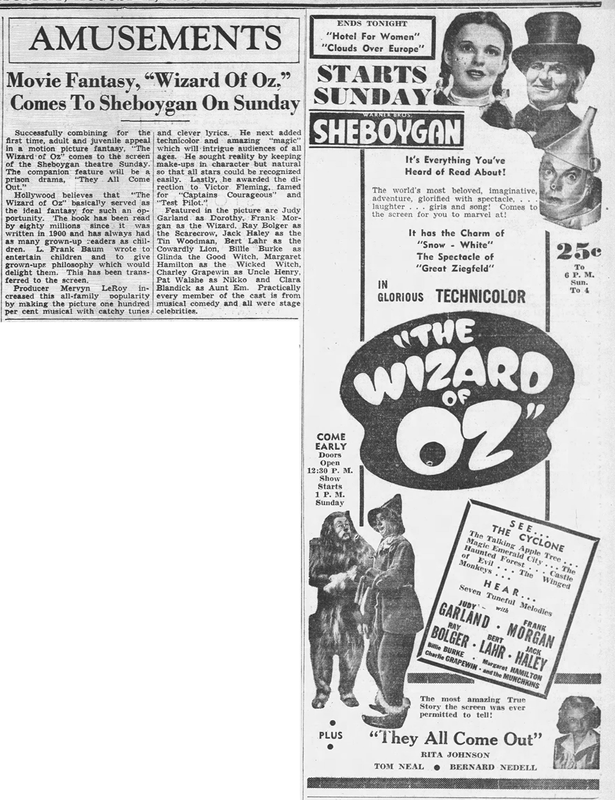 August 12, 1939: The Wizard of Oz had what was previously thought to be its world premiere engagement at The Strand Theater in Oconomowoc, Wisconsin. The reality is that the Hollywood premiere was originally scheduled for August 10 but was moved to the 15th. The film was already scheduled for several dates around the country: August 11: Cape Cod, Massachusetts, and Kenosha and Appleton, Wisconsin; August 12: Oconomowoc, Wisconsin; August 13: Portsmouth, New Hampshire, and Racine and Sheboygan, Wisconsin. 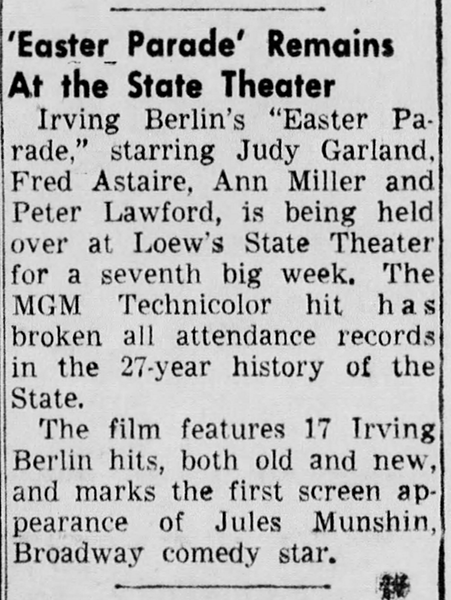 Plus, according to newspaper archives, it appears that it also opened in Green Bay, Wisconsin on either August 11th or 12th. 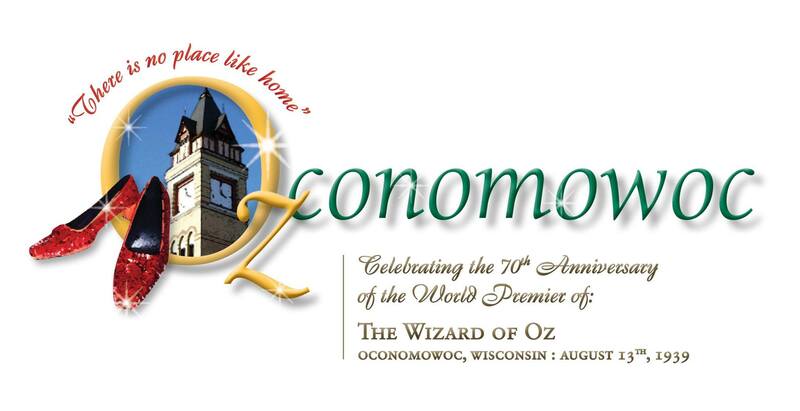 Although Oconomowoc has laid claim to being the premiere location for the film, and it was reported as such for several decades, the film actually premiered on August 11th in the cities noted above. 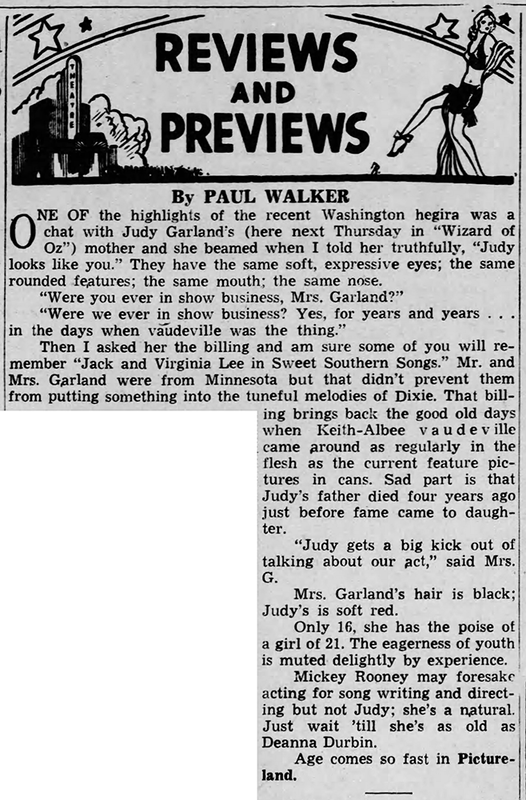 August 12, 1939: Columnist Paul Walker published his short interview with Judy’s mom, Ethel. The interview was done just a few days before when Judy and Mickey were appearing in Washington, D.C.
August 12, 1939: “Star Flashes” featured a fun drawing of Judy as “Baby Gumm” which was obviously taken from a photo of Judy provided by MGM, which had (much like what’s shown in A Star Is Born) photos from its stars’ past. I don’t have a good copy of the photo used in the pic so I’ve included a different shot from the same photo session. 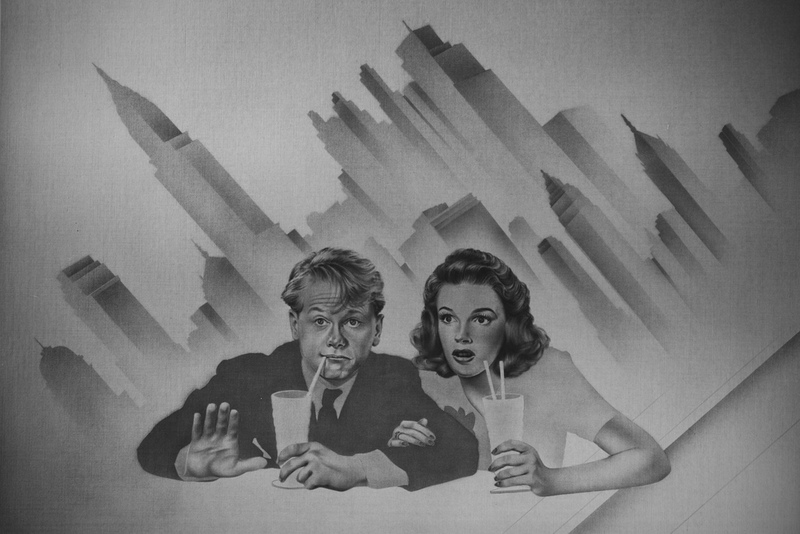 August 12, 1939: The Hartford Courant reported on Judy and Mickey Rooney’s one night of shows at the Loew’s Poli Theater in Hartford. 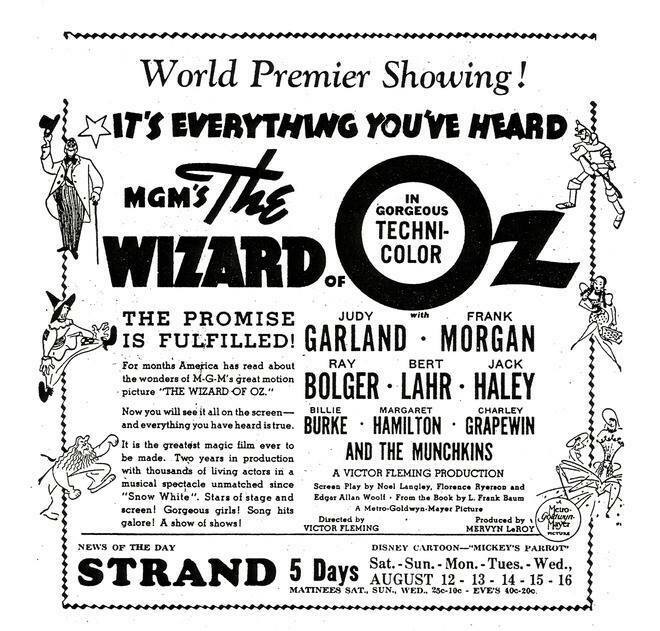 According to the paper, 15,000 people came out to see the duo, who, after giving four performances, were whisked away at 10 p.m. to travel back to Bridgeport where they made another appearance there before heading to New York, and the NY premiere of The Wizard of Oz. 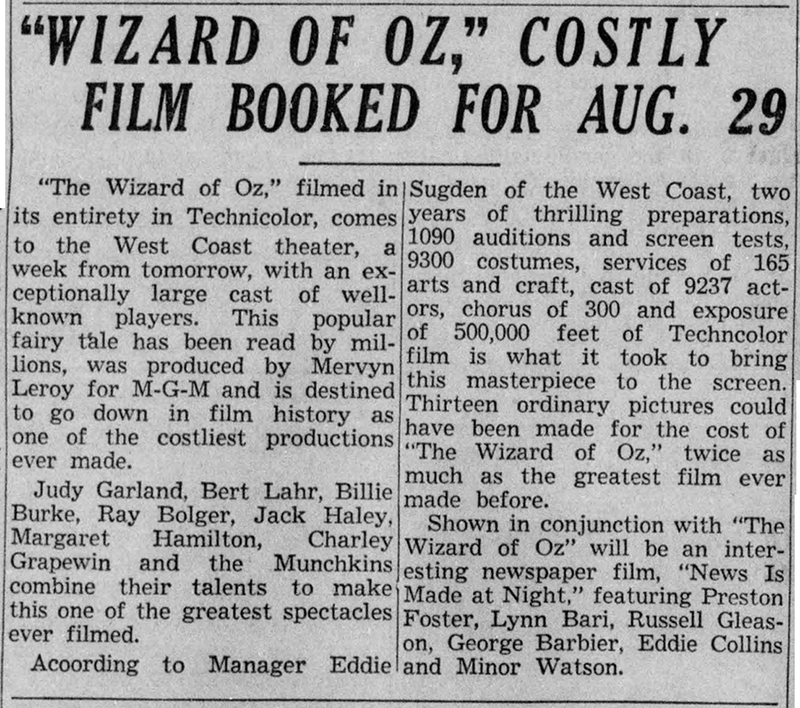 August 12, 1939: A few more Ozzy items from random papers. 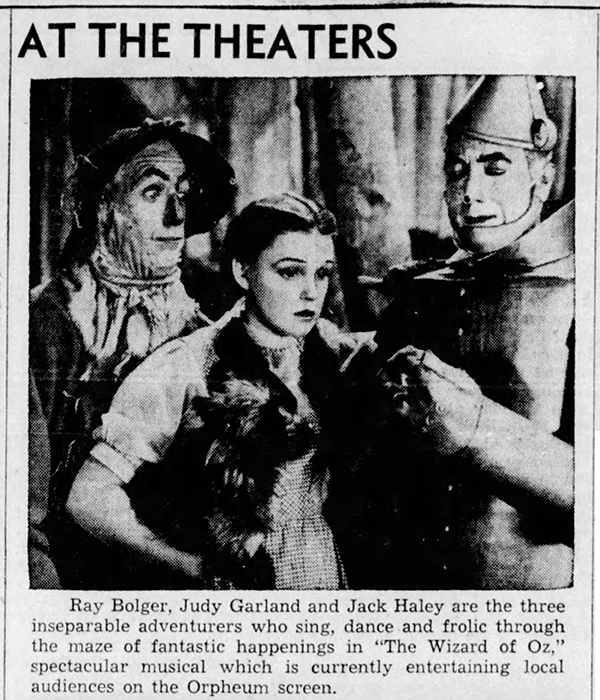 August 12, 1939: Here is an early review of The Wizard of Oz published in the Green Bay Press-Gazette, Green Bay, Wisconsin, which was one of the cities in which the film opened ahead of the world premiere in Los Angeles (see above). Making a movie of a favorite childhood story is, to say the least, ticklish business. 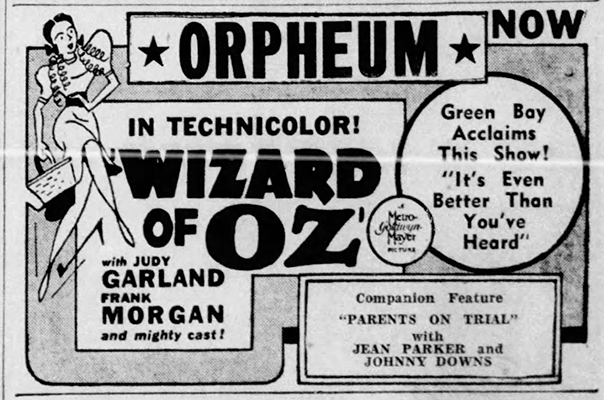 So the highest of the many praises one might heap upon the splendid technicolor picture, “The Wizard of Oz,” playing currently at the Orpheum theater, is this: it doesn’t let us down. Most of us who grew up during the last 40 years are already friends of Dorothy, the Cowardly Lion and the rest, and the motion picture version of the Frank L. Baum [sic]) story is merely brushing up an old acquaintance. Producer Mervyn Le Roy [sic] and Director Victor Fleming have not created a success, however, our of a mere slavish imitation of the story, which has been reassembled to make it more suitable for screening. But the spirit is there, and the gayety, and all the familiar characters. Fleming, incidentally, directed “Captains Courageous,” one of the best films in recent years. In “The Wizard of Oz,” he has undoubtedly created one of this year’s most important movies. Although Judy Garland is a perfect choice for the role of Dorothy, Bert Lahr and Ray Bolger, in their best screen roles to date, steal the show as the Cowardly Lion and the wobble-legged scarecrow. Their dances and songs are hilarious. Jack Haley as the Tin Woodman who wanted a heart, Margaret Hamilton as the wicked witch, Frank Morgan as the wizard and the rest are well-cast, Toto, too, seems the perfect choice for the dog who faithfully follows Dorothy through all her adventures from the time she is carried from Kansas of Oz by cyclone. The cyclone sequence, incidentally, is nothing short of remarkable. 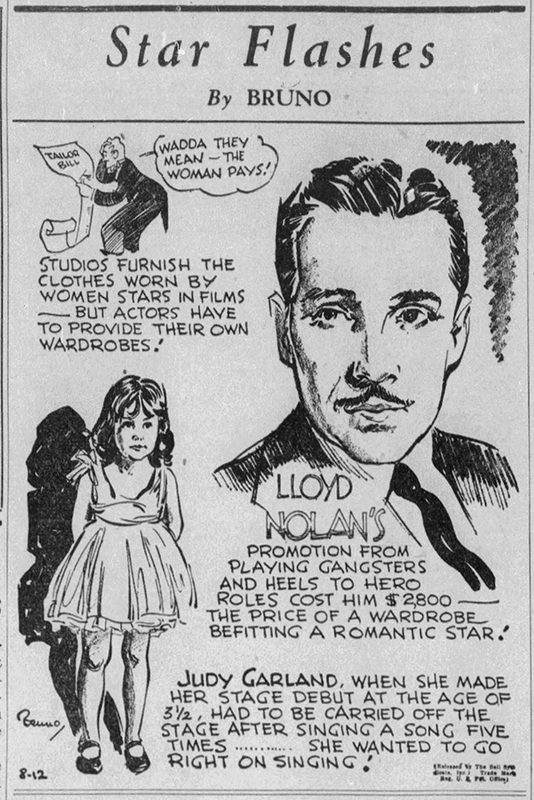 August 12, 1939: Here is the syndicated review from the United Press that was published in many papers around the country during this time. It gave some background on the film, supplied by MGM. Hollywood, Aug. 11 – Best movie that Metro-Goldwyn-Mayer has manufactured in many a moon is “The Wizard of Oz.” It is comparable only to Disney’s “Snow White” – and many people are going to think it’s better. 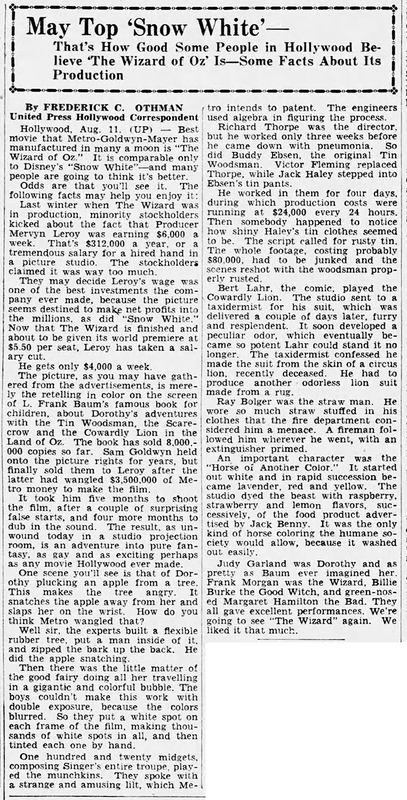 Last winter when The Wizard was in production, minority stockholders kicked about the fact that Producer Mervyn Leroy was earning $6,000 a week. That’s $312,000 a year, or a tremendous salary for the hired hand in a picture studio. The stockholders claimed it was way too much. They may decide Leroy’s wage was one of the best investment the company ever made, because the picture seems destined to make net profits into the millions, as did “Snow White.” Now that The Wizard is finished and about to be given its world premiere at $5.50 a seat, Leroy has taken a salary cut. He only gets $4,000 a week. The picture, as you may have gathered from the advertisements, is merely the retelling in color on the screen of L. Frank Baum’s famous book for children, about Dorothy’s adventures with the Tin Woodsman, the Scarecrow and the Cowardly Lion in the Land of Oz. The book has sold 8,000,000 copies so far. Sam Goldwyn held onto the picture rights for years, but finally sold them to Leroy after the latter had wangled $3,500,000 of Metro money to make the film. It took him five months to shoot the film, after a couple of surprising false starts, and four more months to dub in the sound. The result, as unwound today in a studio projection room is an adventure into pure fantasy, as gay and as exciting perhaps as any movie Hollywood ever made. One scene you’ll see is that of Dorothy plucking an apple from a tree. This makes the tree angry. It snatches the apple away from her and slaps her on the writs. How do you think Metro wangled that? Well sir, the experts built a flexible rubber tree, put a man inside of it, and zipped the bark up the back. He did the apple snatching. Then there was the little matter of the good fairy doing all her traveling in a gigantic and colorful bubble. The boys couldn’t make this work with double exposure, because the colors blurred. So they put a white spot on each frame of the film, making thousands of white spots in all, and then tinted each one by hand. One hundred and twenty midgets, composing Singer’s entire troupe, played the munchkins. They spoke with a strange and amusing lilt, which Metro intends to patent. The engineers use algebra in figuring the process. Richard Thorpe was the director, but he worked only three weeks before he came down with pneumonia. So did Buddy Eben, the original Tin Woodsman. Fictor Fleming replaced Thorpe, while Jack Haley stepped into Ebsen’s tin pants. He worked in them for four days, during which production costs were running at $24,000 every 24 hours. Then somebody happened to notice how shiny Haley’s tin clothes seemed to be. The script called for rusty tin. The whole footage, costing probably $80,000 had to be junked and the scenes reshot with the woodsman properly rusted. Bert Lahr, the comic, played the Cowardly Lion. The studio sent to a taxidermist for his suit, which was delivered a couple of days later, furry and resplendent. It soon developed a peculiar odor, which eventually became so potent Lahr could stand it no longer. The taxidermist confessed he made the suit from the skin of a circus lion, recently deceased. He had to produce another odorless lion suit made from a rug. Ray Bolger was the straw man. He wore so much straw stuffed in his clothes that the fire department considered him a menace. A fireman followed him wherever he went, with an extinguisher primed. An important character was the “Horse of Another Color.” It started out white and in rapid succession became lavender, red and yellow. The studio dyed the beast with raspberry, strawberry and lemon flavors successively, of the food product advertised by Jack Benny. It was the only kind of horse coloring the humane society would allow because it was out easily. Judy Garland was Dorothy and as pretty as Baum ever imagined her. Frank Morgan was the Wizard. Billie Burke the Good Witch, and green-nosed Margaret Hamilton the Bad. They all gave excellent performances. We’re going to see “The Wizard” again. We liked it that much. August 12, 1940: Judy completed filming on Strike Up The Band with scenes (mostly retakes) on the “Interior Train”; “Interior Attic”; and “Interior Lower Floor” sets. Time called: 9 a.m.; dismissed: 6:15 p.m. The film cost $851,577.78 to make and grossed a whopping (for the time) $3,472,059. It’s the second of the four Judy Garland/Mickey Rooney “Let’s Put On A Show” musicals. 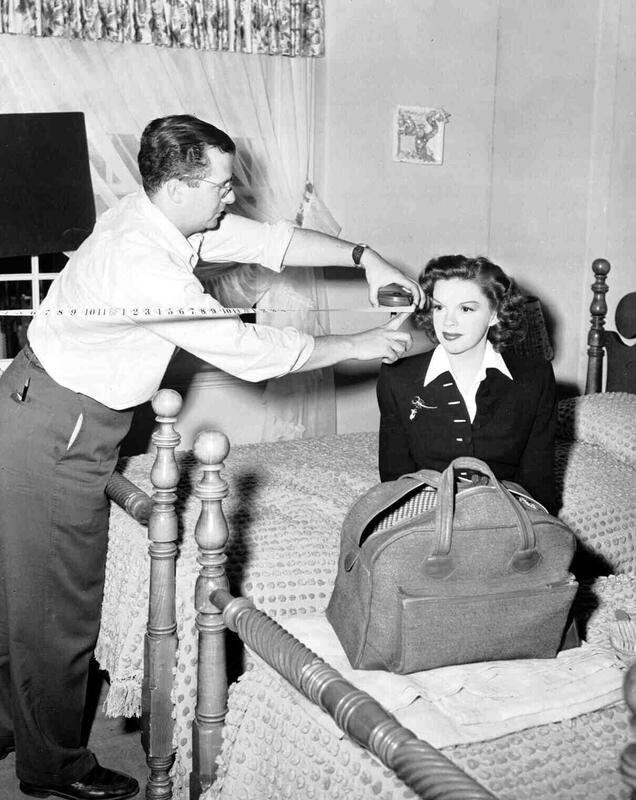 August 12, 1941: More filming on the “How About You?” number for Babes on Broadway on the “Interior Morris Parlor” set. Time called: 9:45 a.m. The assistant director’s notes state “10:08-10:16 – wait for Judy Garland – late.” Lunch: 12:30-1:30 p.m.; dismissed 6:10 p.m.
Sca of promotional artwork provided by Kim Lundgreen. Thanks, Kim! August 12, 1944: Filming continued on The Clock with more scenes shot on the “Interior Living Room” set as well as the “Bedroom – Alice Apt.” set. Time called: 10 a.m.; time dismissed: 3:20 p.m. 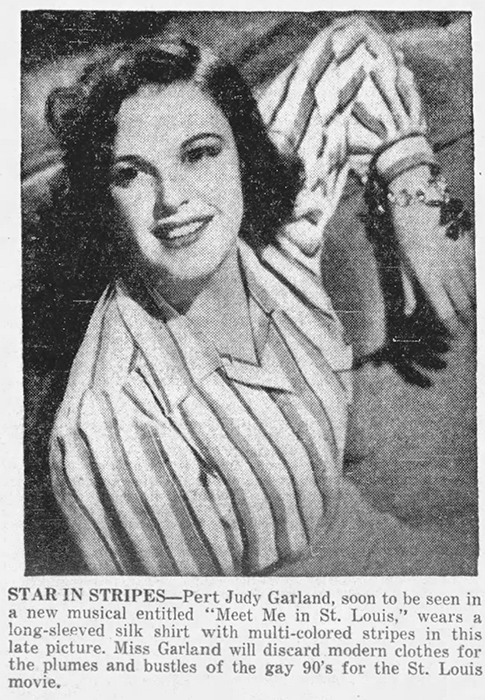 The image above right was published on this day (and several other days), “Star in Stripes” featuring a photo of Judy taken in 1940. August 12, 1945: In the Curio Department. 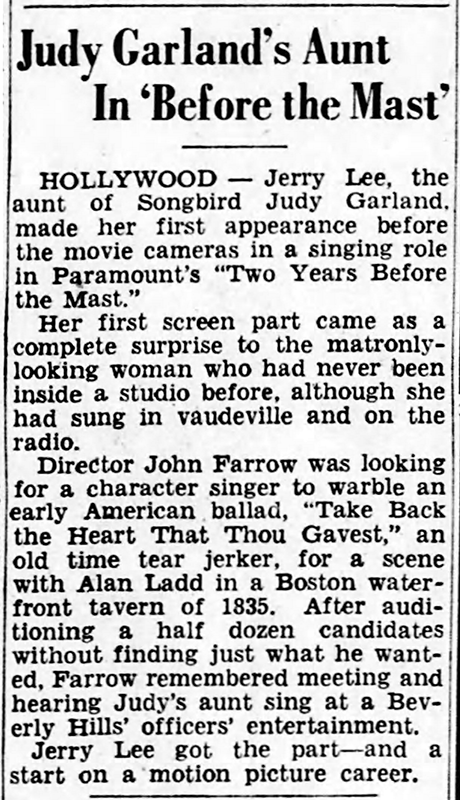 Here’s an article about Judy’s aunt, Jerry Lee, who was also a singer and snagged a job singing “Take Back the Heart That Thou Gavest” featured in the Paramount film Two Years Before the Mast starring Alan Ladd. IMdB does not give her name in its expanded listing for the film nor any listings for any “Jerry Lee” aside from one actress who appeared in two movies in the late 1940s, but not this one. I haven’t seen Two Years Before the Mast, so I can’t confirm if Lee’s bit might have been cut from the film before its release in 1946. August 12, 1947: The “Show Time #275” radio show was broadcast. The show was recorded in advance. Judy was currently in the Riggs Center in Massachusetts. No other information is known about this show or its content. 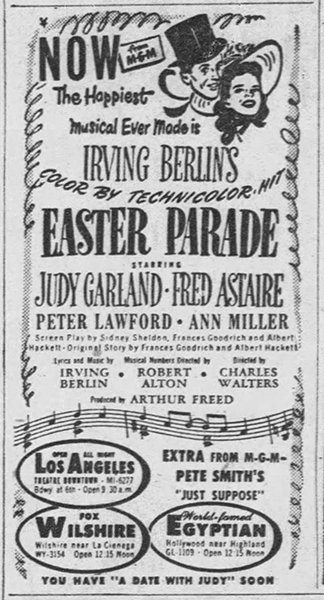 August 12, 1948: Both The Pirate and Easter Parade were still doing “boffo business” with Easter Parade being held over in some theaters due to its popularity while critics were raving. 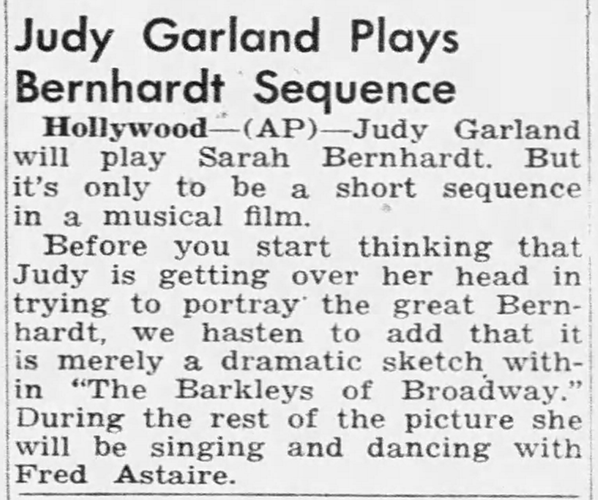 The first clipping above features an early mention of Judy’s upcoming role in The Barkleys of Broadway, which sadly she was unable to complete. 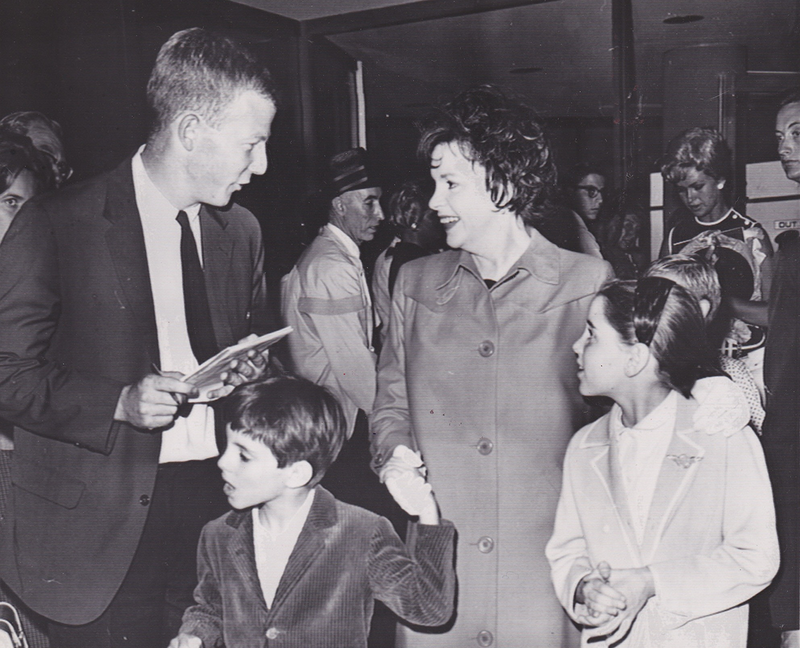 Check out The Judy Room’s “Films That Got Away” page for details about Judy’s work on The Barkelys of Broadway here. 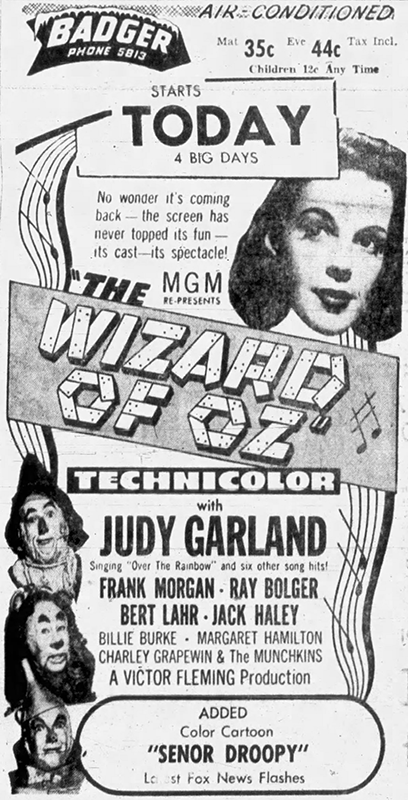 August 12, 1949: The Wizard of Oz at ten. The review on the left by Wood Soanes, the same Wood Soanes who predicted great things for Judy back in 1934 when she and her sisters were in San Francisco performing. That review is the last clipping above. Soanes was a lifelong Garland fan as is apparent in his reviews over the years (see May 25, 1952, for an example). 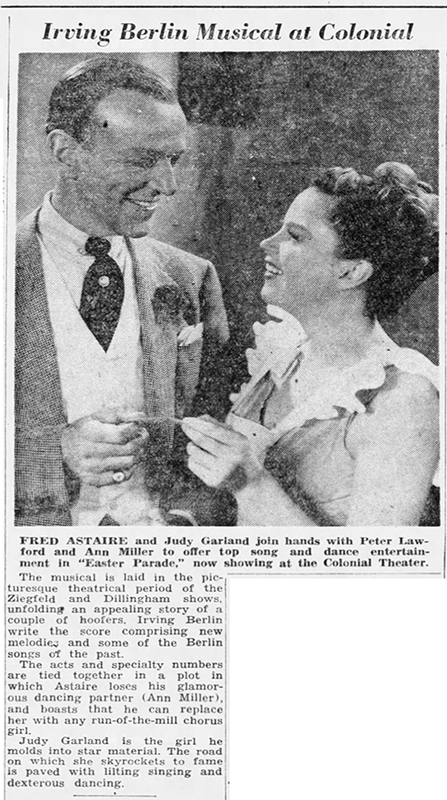 August 12, 1950: Here’s a great review of Summer Stock that notes how the critics loved Judy in the film, cheering her brilliant rendition of “Get Happy.” This was important because Judy was currently in Boston for another rest and cure after attempting to commit suicide in June. The event had people wondering if her career was washed up and if her public would support her or not. Judging from the public’s response to Summer Stock (and the critics as well), Judy’s career was not washed up but merely on hold. August 12, 1951: Judy arrived in New York after her successful comeback at The London Palladium and subsequent tour of England and Scotland. The stage was set for her phenomenal, history-making debut at The Palace Theater in New York. Judy Garland, as a big-hearted, outspoken youngster, probably held more power over Clark Gable in public than any other living person. 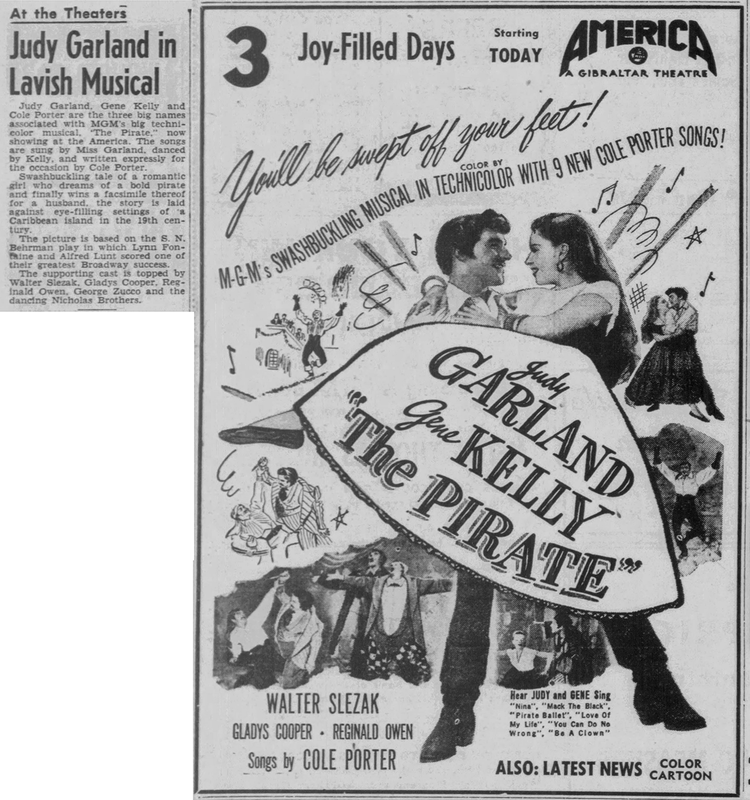 She was just a fledgling, countrified and fidgety when an eager-beaver Hollywood composer got the bright idea of writing a song – for Judy to sing to Mr. Gable. 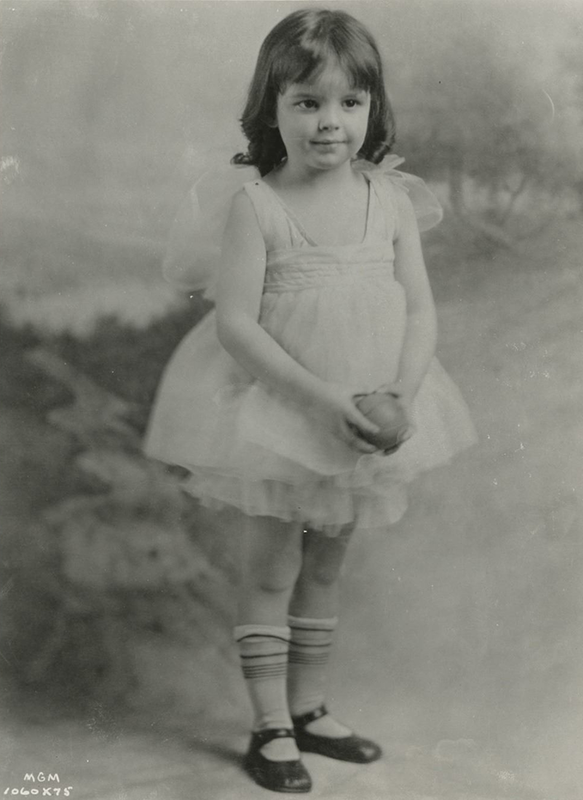 But long before Judy Garland hob-nobbed with the great Gable, she was known as one of the Gumm sisters who were much in demand for benefits. Judy, who was wearing her famous tramp costume complete with scraggly wig and baggy coat when interviewed on a movie set, recounted the well-known story of how she finally got her name. “Boy, try and sing sad songs with a moniker like that,” Judy laughed. She was saved from a fate worse than obscurity by George Jessel who happened to be on the same bill. 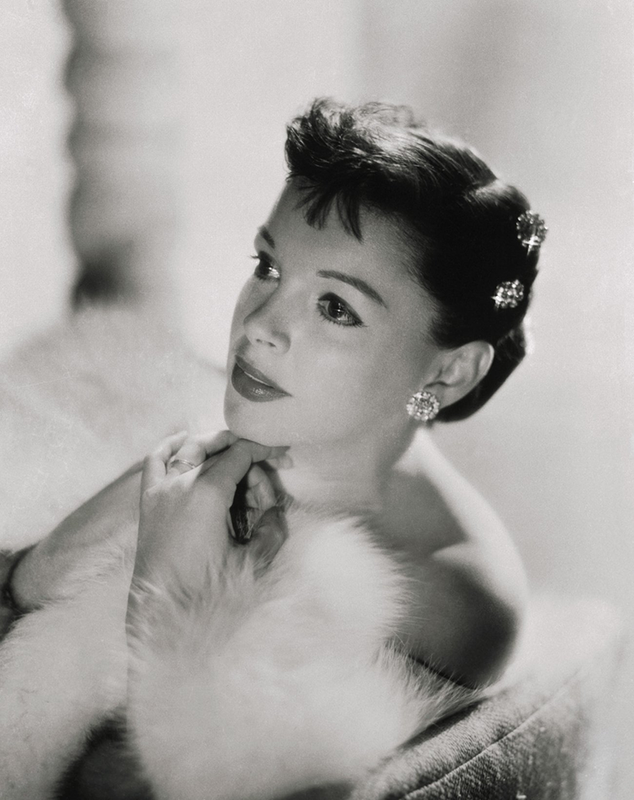 It was Louis B. Mayer in person who listened to Judy sing and signed her to a contract without even a screen test. Judy has had a constant battle with the weighing scales ever since. “One of the saddest things I ever heard anyone say happened in New York one night when I was having dinner with a group of entertainers including Tallulah Bankhead. 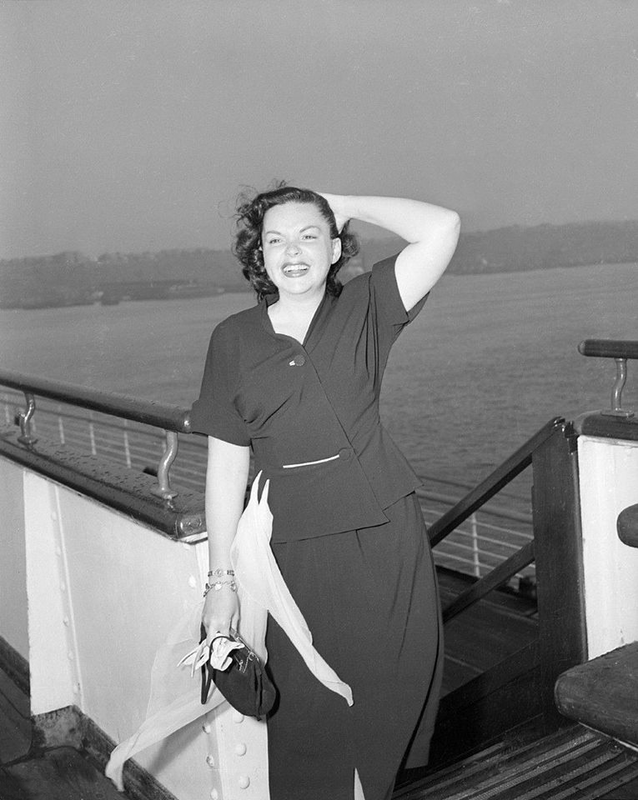 She now is having an opportunity to recuperate from the strenuous eight-month grin of “A Star Is Born.” Warner Brothers, producers of the film, sent Judy and her husband, Sid Luft, to Europe (all expenses paid) for a well-earned rest. 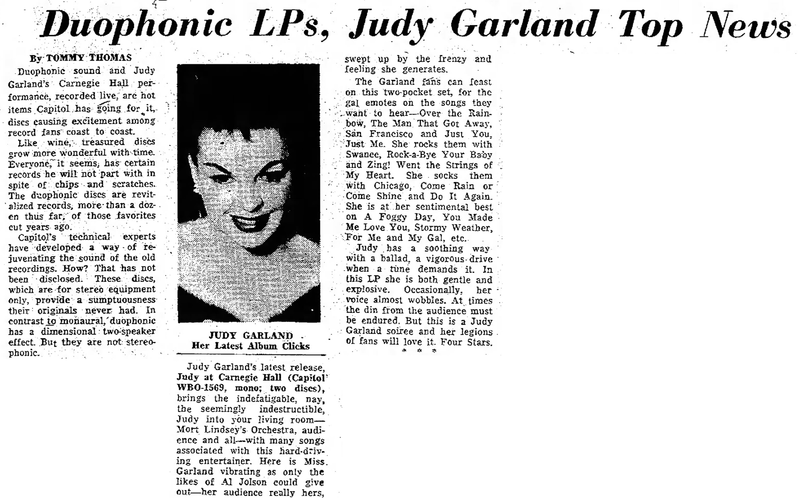 August 12, 1961: The success of “Judy At Carnegie Hall” continued. Here it’s given four out of four stars. Naturally! August 12, 1962: Judy arrived in Los Angeles after having spent April through August in England filming I Could Go On Singing which turned out to be her final film. Judy stayed at the Beverly Hills Hotel. Shortly thereafter she flew to Lake Tahoe in Nevada, where she filed for divorce again from husband Sid Luft. While in Tahoe Judy went on a fast, drinking nothing but two cups of tea all day. By mid-September, she had slimmed down to 100 pounds. August 12, 1964: Judy’s last recording session, ever, for records: Lionel Bart’s “Maggie May” for Capitol/EMI Records, in London. The 45rpm EP (Extended Play) record was only released in the United Kingdom. August 12, 1965: Judy and Mark Herron vacationed in Northern California, near San Francisco. On this date, it was reported that Judy had stopped at a private home in Yankee Point to ask directions to the Hillsdale Inn. August 12, 2010: Google’s “doodle” for the day celebrated the 71st anniversary of The Wizard of Oz. Maggie May: ASTONISHING. I was always under the impression that Garland’s voice was shot after her TV series. Now, I’ve been proven wrong. Here, she is her all-time best, singing with such zest and POWER! Wonderful tracks. Thank you, thank you. at about the 12:30 mark. Any pictures of Jerry Lee extant? PS – I wonder if that’s Lee singing in the film or if it’s another actress who was dubbe with Lee’s voice?